I tell myself that I’ll just play one more round. One more round and then I’ll go to sleep/send out resumes/feed my dog/make dinner/be a human being again. I start to tap on the screen to control my yellow bird. Carefully, I guide him?/her? up and down the screen narrowly avoiding a series of green tubes. On the screen, numbers slowly ascend in increments of one, with each set of tubes that my bird flies through. One … two … three … four … things are going well. My bird and I find a groove; we are one. Inexplicably, my finger fails to tap the screen fast enough or taps it slightly too fast and my yellow bird narrowly brushes against a green tube. He/she plummets to the ground and the words “GAME OVER” appear on my screen. My final number is recorded, and I am presented with a “medal.” The round is over. I look at my clock. Two hours have passed. I tell myself just one more round. “Flappy Bird” left us on February 9th, 2014. It is never to return. I think. The mindless and mind-numbing game skyrocketed in popularity recently, enough to become the most popular free mobile game on the Apple App Store and Google’s Android Play Store. According to reports, “Flappy Bird” had been downloaded 50 million times and was pulling in about $50,000 per day in advertising revenue for its creator, Dong Nguyen. So, it undoubtedly came as a surprise to fans of the game when Nguyen announced on Twitter that he would be taking the game down. Other than the cryptic Tweet, Nguyen has offered no real explanation for why the game was taken down, other than to clarify that it wasn’t related to legal issues. 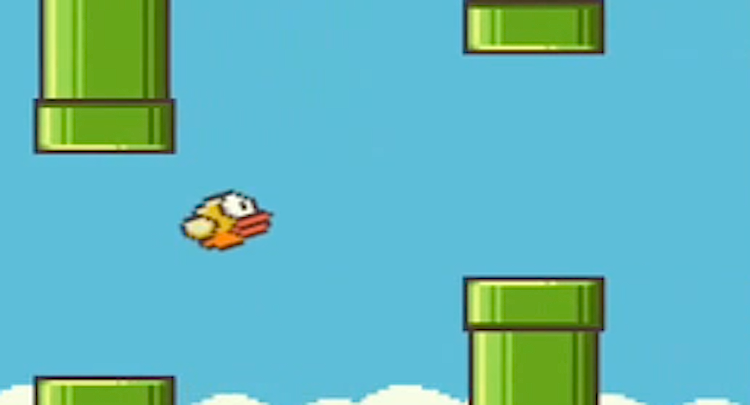 Some have speculated that Nguyen could face legal issues due to “Flappy Bird’s” green tubes sharing an almost identical resemblance to the green tubes in the Super Mario franchise. But, there is no definitive answer, and it’s hard for many to understand (this writer included) how the game’s creator could have turned his back on a gold mine. Attempting to capitalize on the absence of “Flappy Bird” is an almost identical game called “Ironpants.” So, if you weren’t fortunate enough to hear of the latest internet craze before it abruptly ended, you could download that game, I guess. (If you already downloaded “Flappy Bird,” you can still play … for now.) And while it is the same, it’s just not the same. Or, if you are really desperate and don’t know a friend that’s downloaded it already, you could head over to Ebay. Shortly after the game was gone from the App Store, listings began to appear on the online bidding site for iPhones that have the game installed already. They’re not going for cheap, either. Without fail, I’m always amazed by the latest app or Startup, which makes its creator(s) millions of dollars. I’m amazed both because of how stupidly simple the ideas behind the app/Startup almost always are and by a bigger corporation’s willingness to throw money at something that might fail a few years down the road. None of it makes sense to me. I really wish I could figure it out. If I could, then I could stop looking for a job and just create an endless series of addictive apps. But I don’t have the programming skills to do that even if I could figure that out. Maybe I should just think of the idea and have someone design it for me. We’ll split the profits 50/50. That’s what I’ll do. How hard could that possibly be? I’m going to get on that. You might not read anything from me for the next few weeks. I’ll be busy developing the next great app/Startup that will sweep the nation by storm. I can’t waste any more time. I’m going to start right now. Hmmm … in what way do you mean? I didn’t really get any menacing or foreboding feelings from this story but maybe you read something I didn’t. Care to elaborate? I’m interested in what you might have heard. What I took away was this: this humble dude makes some inane flash game that he knows is just an inane flash game, it somehow soars into insane popularity long after he probably forgot he made it, then gets a month of death threats over twitter, a kotaku article bashing him, and what seems to have truly affected him deeply, the knowledge that his game is like crack to children on the internet and it’s making them insane. A lot of his tweets were along the lines of “yo, have fun with my game, don’t over do it” or “come on, it’s just a game, don’t let it stress you out.” I feel so bad for him. OK, I see what you mean now. That’s a good point. Thanks for clarifying.